Home / Founding texts / Financial markets: mission impossible? 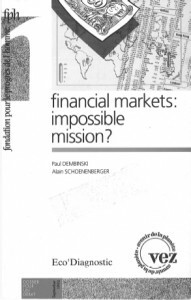 Financial Markets: Mission impossible?, Paul Dembinski and Alain Schoenenberger, Charles-Léopold Mayer Foundation for Human Progress, Paris and Lausanne, 1993. There is no universal, unchanging answer to the question ‘Financial markets – mission impossible?’, which was asked by Professor Maurice Cosandey back in 1991. Indeed, if our enquiry is to be relevant, it must take full account of the experiences of financial markets all over the world. From this point of view, we can now divide the countries of the world into four basic groups: OECD countries, ‘emerging markets’, ‘emerging market economies’ (i.e. post-Communist countries) and the rest of the world. Accordingly, our original question can now be rephrased as follows: ‘What are the roles of financial markets, and what kinds of financial markets can fulfil these roles?’. 2.3. Share prices and growth : a parting of ways ? 2.7. How companies are financed ? 2.8. The purpose of stock markets : managing wealth or allocating resources? 3.4. Portfolio investment in emerging stock markets – a blessing or a burden?